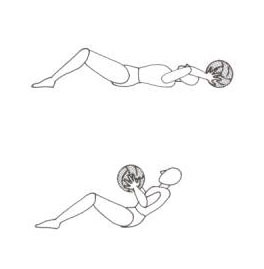 You can do almost any exercise and work every part of your body with a Medicine ball. Here are a few basic exercises you can do for body conditioning. For more Sport-Specific exercises, check out the book below or our Sport-Specific Videos for more in-depth coverage into your sport by professional trainers. Tricep Press. Stand in a stable position with your feet shoulder width apart and hold the ball up over your head to full arm extension and then lower it back to the starting position. Basketball, volleyball, aerobics Bicep Curl. 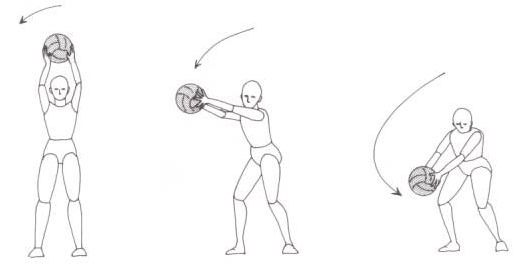 Stand in a stable position with your feet shoulder width apart and hold the ball in front of your thighs at full arm extension.Keeping your back straight, lift the ball upward to face level, and then lower it back to starting position. Volleyball, aerobics, bowling. Giant Circles. 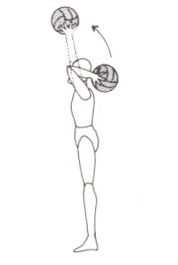 Stand in a stable position with your knees bent slightly and hold the ball above your head at fullarm extension. To complete a circle lower the ball down along one side of your body, sweep the ball in front of your knees, and lift the ball along the other side of your body. At all times keep your back and arms straight, and only lower your body by bending at your knees. Track and field, aerobics, ice skating. and bouncing for throwing off walls and against the ground. Or go to the Plyoball store above for different weights and accessories. 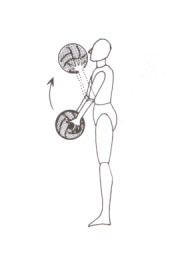 Dr. Don Chu's Plyometric Exercises with the Medicine Ball Get these exercises and over 100 more! - featuring descriptions, diagrams, and even workout plans for every sport and exercise, showing which muscle groups are worked. Jump USA is America's #1 Sports Training Superstore!